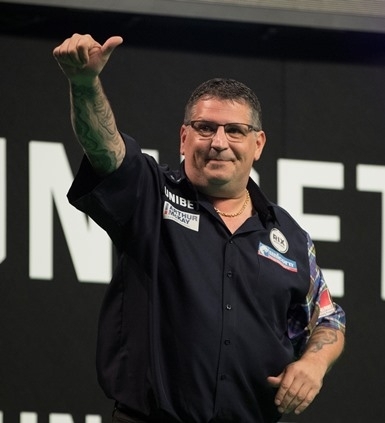 He really is in a rich vein of form and Gary Anderson has raced through to the World Grand Prix quarter-finals. He taught Jeffrey de Zwaan a harsh lesson in their all Unicorn 2nd Round clash in Dublin on Tuesday night. Anderson lost only one leg in the match and will now face defending WGP champion Daryl Gurney in the last eight. The Scot was in control from the off as he nailed an 84 finish to take the opening leg against the throw. He breezed through the set without reply. De Zwaan won his only leg in levelling the second set but a superb 90 check-out on the bull saw Anderson take the set. The Dutchman had very few chances. A superb 177 set Anderson up to take the opening leg of the third set on D5. He then hit 174 to leave D4 and won it in some style with a majestic 130 finish. Anderson was 9/14 on the finishing doubles....impressive indeed. In Tuesday’s other games, Michael van Gerwen lost only one leg in his win over Darren Webster. He plays Dave Chisnall next after ‘Chizzy’ demolished Raymond van Barneveld. Gurney had to fight hard to beat Ron Meulenkamp in a deciding set.